The program for upper grade students held at St. Christopher School in Northeast Philadelphia on Jan. 23 was unique but one wishes it was not. There should be many like it. It brought together students who represent the three great Abrahamic faiths: Judaism, Christianity and Islam. 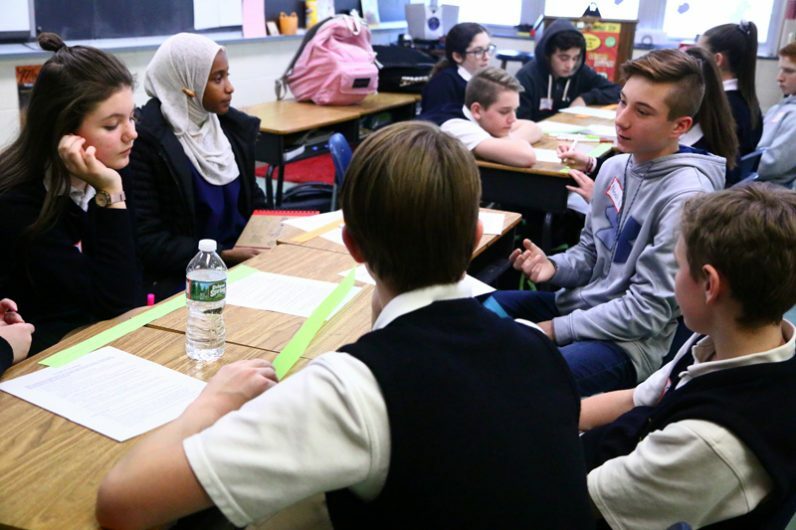 Their schools, Jack M. Barrack Hebrew Academy, Al-Aqsa Islamic Academies and St. Christopher, are also located in different socio-economic areas of the Philadelphia region — Bryn Mawr, Germantown and Northeast Philadelphia, respectively — but that was not the point. It was part of the Writers Matter Interfaith Initiative, a program developed by Dr. Robert Vogel, professor emeritus in the Department of Education at La Salle University. His Writers Matter program encourages students to write about what is happening in their lives. The interfaith offshoot has the specific purpose of helping the students better understand the different religions of the world and what they have in common, Vogel said. Last year there were joint visits to all three schools, and this year, Al-Aqsa Academy and St. Christopher’s have been visited, with Barrack Hebrew Academy yet to be visited. Of all the Catholic schools in the area, St. Christopher was recommended for the initiative because its student body is virtually entirely Catholic and located in a heavily Catholic section of the city where the students may have little previous contacts with other faiths, Vogel said. It is not just one-day excursions to other schools, according to St. Christopher eighth grade teacher Diane Peters. The faculty members attended meetings at La Salle to plan the activities for the year. There were writing projects for the students and question-and-answer discussions via the internet with the other schools. In that way the students could better understand their similarities and their differences. Part of the day at St. Christopher, as it was with the other schools, was a visit to its worship site, in this case adjoining St. Christopher Church where Permanent Deacon James O’Neill explained how Catholics worship, the liturgy and the significance of the various objects in the church, and patiently answered dozens of questions. Following lunch, the students formed into small intermixed groups for joint projects and socialization. This was done under the guidance of teachers from the three schools, all enthusiastic supporters of the program. But at the end of the day it is what the students themselves got out of the program. Mishall Khan, in eighth grade at Al-Aqsa, does have friends who are not Muslim, but they never talk about religion. “It is important to reach out to other people” she said, although she could not understand the concept of the Trinity, one God in three persons. Eliana Pasternak, in eighth grade at Barrack Hebrew Academy, also attended the program last year. The entire programs wouldn’t be possible without the full support of the three schools, and at St. Christopher they certainly have that. Maybe that’s the greatest lesson of all. It’s a win-win situation. Children are innocent. Mixed schools will foster multicultural vales. This is unacceptable. If Christ is the Way, the Truth, and the Life, then how can we teach our kids that these other “Abrahamic religions” are in any way equivalent to our own.